30th of August. The weather is fine on this day. The fireworks should appear beautiful in this weather. In the Fireworks Festival a.k.a. Tachibana City Fireworks Festival, besides fireworks, there are performances like Bon Festival dance and Taiko, and you can partake in the food stands and flea market. For the finale, over 10 000 fireworks will color the night sky. The highlights are magnificent star mines, humongous skyrockets and elaborately-planned preset fireworks. All of that makes up Tachibana City’s grand event as summer comes to a close. Mitsuki, clad in a dark blue yukata with images of carnations, is unmistakably the cutest girl in the world. On her head is a fluffy hair ornament that’s also in the design of a carnation. The pearls inlaid on the petals glitter, complementing Mitsuki’s angelic appearance. I may sound like a foolish doting parent but Mitsuki is really cute. The Mitsuki tilting her head in puzzlement is cute too. I suppose Mitsuki really does think that I’m cool. It’s not certain I’ll be here next year. I give a vague reply as though I’m trying to evade the loneliness that stems from that. Mitsuki’s expression makes a complete reversal from puzzlement to smiling faintly with the corners of her eyes turned down. Mitsuki’s meeting Takayanagi at Tachibana Station while I’m meeting Soutarou and Kaname at Sakaki Shrine, the main venue of the Fireworks Festival. Mitsuki’s meeting time is 1 hour before mine. To see off Mitsuki who’s heading out first, I accompany her to the entranceway. I tell her as I correct the position of her hair clip. As though having had gauged the moment Mitsuki will be leaving the house, my phone rings. Seeing as Soutarou’s coming to pick me up, it’s about time I prepare to head out too. Simple works for summer fashion, which is good. One can look somewhat decent with jeans, cut-and-sew, and a cardigan. Along with my wallet and handphone, I’m all set. Just as I get to take a breath after finishing my preparations, the intercom sounds. The clock indicates 16:30. There’s 30 minutes till our meeting time so it’s just about right. With that in mind, I try to leave from the entranceway but Soutarou quickly blocks the way. I’m bewildered at the iron wall guard made by the blockage of the muscular guy before me, who’s more than 180cm tall. Not understanding his intention, my bewilderment transcends into irritation. I raise my head and crash into the gaze from his downcast eyes. The tip of his red, wet tongue peeks out from his slightly open mouth and he slowly licks his lips. My instincts inform me of the danger. Generally, nothing good happens when Soutarou makes this face. The Soutarou smiling sweetly with his head tilted is the usual Soutarou. Still, Soutarou’s kind of scary recently. I feel a considerable amount of danger for my chastity. I don’t really get it but I’m bad at dealing with this face that guys make. When a guy whom I fool around and spend idle days with suddenly shows a masculine face, I’m so bad at dealing with it that I feel like crying. I feel like throwing everything away and escaping. Even though I clearly know I shouldn’t and that escaping like this won’t always work. I know that a day will come whereby I’ve to face Soutarou properly. I’m, clear on that. This Sakaki Shrine is the main venue of the Fireworks Festival. Closely-packed food stands are set up in Sakaki Shrine and there’s a small stage at the plaza where mini-performances are carried out. A student band is currently presenting their musical performance. Reaching the place of meeting, Kaname’s already eating grilled skewered chicken bought from the food stands. Kaname busily chews the grilled skewered chicken as he makes a V-sign. The festival music that can be heard from afar, the smell of the cheap-looking sauce from the food stands and the colorful yukatas. The humid air and fluorescent lights. Everything is nostalgic, making my chest feel tight. I wonder what should the extremely exciting yet extremely sad feeling that appears at times like this be called? I spot a shaved ice stand relatively nearby. A young big brother is operating the stall without much enthusiasm. I do like sweet things but I prefer meat in comparison. Where’s the takoyaki stand? Looking around, I see a food stand that says ‘Takoyaki’ opposite the shaved ice stand. Over here’s a young big brother too, but he’s operating the stall while perspiring. I suppose it really is tough to be in front of a hot plate for a long period in summer. The takoyaki stand smells of savoury sauce. Sure enough, takoyaki is a must in festivals. It’s not exactly done that well and is ridiculously priced but somehow one would feel like having it huh. Lifting my head up when my name is called, before my eyes is Ichigo-chan who’s grilling takoyaki. 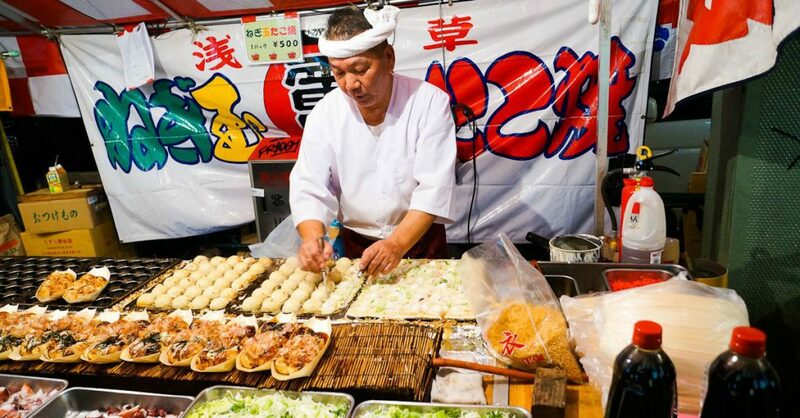 With the sleeves of his short-sleeved shirt rolled up and a towel wrapped around his head, Ichigo-chan’s grilling takoyaki in the fashion of a food stand big brother. His grim facial features and build deepens the impression of a food stand big brother. Looking at it closely, written at the end of the shop curtain that says “Takoyaki”, is “Presented by: Kuzuha Minami Technical High School PTA”. I was going to say ‘I came with Soutarou’ but Ichigo-chan will probably be unhappy if I say that. Let me first apologise for my upcoming narcissistic statement but Ichigo-chan probably doesn’t hate me. If he knows that I came to the festival with other guys ―― moreover with someone he thinks of as a rival, it’s inevitable that he gets unhappy. I shut my mouth the moment I thought of that but Ichigo-chan, with his sharp, animal-like instincts, raises his brows. Ichigo-chan makes a clearly unhappy face. He’s totally angry. Ahh he totally got angry. His already-scary face is even scarier when he gives out a sense of intimidation like this. In this situation where I’m not doing anything wrong and am just going to a festival with friends, why do I have to be held accountable? With this in mind, rather than apologetic feelings, anger wells up in me. I was going to fire back but got shot instead. Certainly, Soutarou has an aggressive side. However, fundamentally, he’s properly considerate of me. Kind and cheerful, he’s a silk floss-like good guy. It’s unknown when he appeared. Soutarou hugs me tightly from behind. Soutarou won’t do anything I dislike. He definitely won’t. However, it’s also true that, while I’m still unsure whether he’s airheaded or two-faced, there are times he vigorously aims for my chastity. If the face he makes when he aims for my chastity is the true Soutarou, it’s considerably scary. If he’s pretending to be attached to me as he gives out a soft and fluffy aura, grows dog ears and tail and cries ‘Woof, woof’ at normal times, when he’s actually watching my chastity with eagle eyes. That’s freaking scary. With a miserable expression, Soutarou’s dog ears flops as he cries, ‘Kyun, kyun’. Speechless, I maintain my silence. Soutarou’s eyebrows increasingly droops as he makes a face as though he’s about to cry. Trifle conversation like this continues for 30 minutes. Needless to say, Kaname, who was waiting for us, got angry. Please do not post elsewhere or steal. Towel wrapped in this or this manner. I’m on Team Takoyaki! … I should go to Shirokiya and eat takoyaki. ..
Next time I go to Walmart, I’m gonna eat it! Yaa should change from dog ears ‘Kyun, kyun’ to wolf ears for better image right Mako-chan? As he’s a wolf in a sheep’s clothing!! And Thank you for the chapter!! It’s been awhile, what luck for spotting it today! Team All the Food omg. I would buy everything probably. Ehhh I don’t really like this new revelation of Soutarou’s personality; it feels like he waffles between respecting and trampling Mako’s boundaries. Ichigo and Prince seem so much more honest and straightforward. Mitsuki is, of course, the cutest ohoho~ Thanks for the chapter! !